Here are the answers to your questions….. When is the 2019 Cricklade Festival? The 2019 Festival is on Sunday June 16th. It starts at 11am with a parade down the High Street and ends at 4pm. Cricklade is a small town midway between Swindon in Wiltshire and Cirencester in Gloucestershire. There is a map on the Contact Us page if you need more detail. By Road: Travelling on the A419 : leave at the Cricklade junction (B4040 to Malmesbury) – go straight over roundabout and follow signs for designated carparks. Travelling on the B4040 from the Malmesbury direction : at the first roundabout in Cricklade follow signs for designated carparks. Travel on the B4553 from the Purton/North Swindon direction : at the first roundabout in Cricklade follow signs for designated carparks. By Rail: The nearest train station is at Swindon which is served by frequent Great Western Railway services from London, the South West and South Wales. It also has local links to Gloucester and Cheltenham. The bus station is a short walk away and there is a reduced bus service on Sundays (try www.swindonbus.info for further details – service routes 51 and 51A). There is a taxi rank outside the train station and the travel time to Cricklade is around 15 – 20 minutes. Cricklade has no local taxi service so make sure that you take details of your driver/company for organising your return trip. Is there a car park and if so, where is it? The main visitor car park is on the Cricklade Rugby Club Pitch near the entrance to Cricklade from the A419. It will be signposted no matter which way you enter Cricklade. Parking is free, but please consider a contribution to the local Fire Cadets who will be looking after the car park throughout the day. Please note that the barrier at the rugby club site will be closed at 18:00, so please ensure that you have removed your car prior to this time. Cricklade Festival opens at 11:00 with a parade up and down the High Street. Allow around 10 minutes to walk from car park areas to the High Street. It ends at 4pm. How do I find out what’s on? Information on the acts, activities and other attractions can be found here and a schedule of the acts and where they are performing can be found here. A free Festival brochure, which contains all the information you’ll need for the day, will be available from the Information Desk on Festival day. The Information Desk is outside Tescos on the High Street. The Cricklade Festival welcomes dogs of all breeds, shapes and sizes, however note that no dogs are allowed on the Festival Field. Please clear up after your dog, there are plenty of bins around the Festival areas. Public toilets are located between the High Street and the Festival Field. (behind Tescos). What activities are there for children? There are plenty of activities for children including arts & crafts, puppet shows and fairground rides. How much does it cost to come to the festival? Entry to the Cricklade Festival is free, our aim is for you to have a happy fun-filled time. All of the stage entertainment provided by us is free, however some of the attractions may charge. What food and drink is available? Most of the pubs and food outlets in Cricklade will be open all day and will be providing all sort of hot and cold food. There will also be a number of additional food stands. Of of course, you are welcome to bring a picnic! What provision is there for people with disabilities? Dedicated parking is provided for people with disabilities in the car park of St Sampsons School. Signs will indicate access to this car park. All areas of the Festival are suitable for people with disabilities, but if you are unsure, please contact us and we will do our best to help. I’m a resident of the High Street, where can I park my car? The High Street will be closed from 8am to 6pm. You will be asked to remove your car from the High Street during this time. You will be able to park your car in the car park of St Sampsons School. Please contact us if you would like to do so. I live in North Wall, how do I enter and leave Cricklade while the road is closed? A diversion is in place as indicated in the map below. 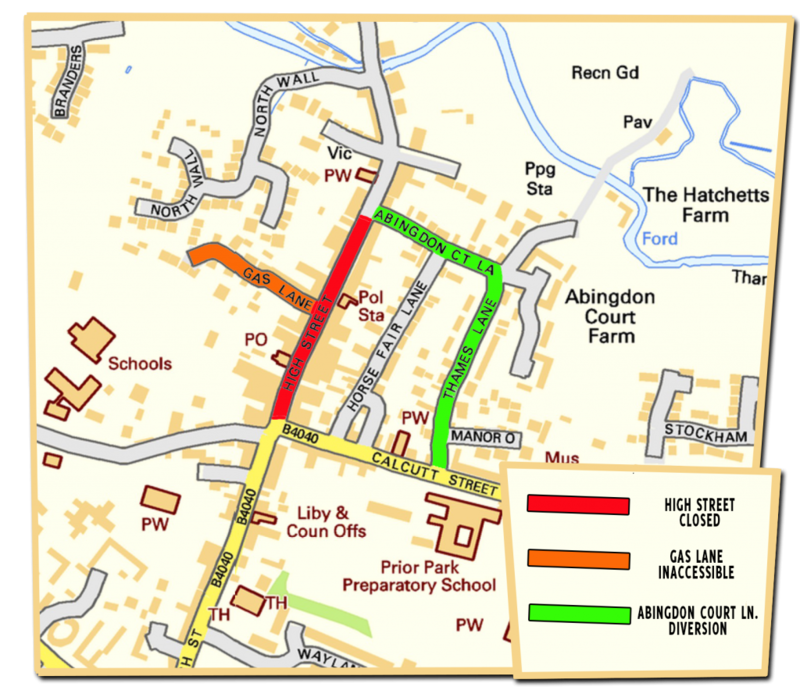 Please note that Abingdon Court Lane is a 2-way road during the period of the road closure. Can I get involved with next year’s festival? Yes, we are always looking for volunteers and we would love to hear from you. Please Contact Us. How can I advertise in next year’s Festival Brochure? The advertisers that you can see in the brochure play a big part in the funding of the Festival. Without their support. the Festival would not take place. If you would like to advertise in the brochure, then we would be so pleased to have the opportunity to tell you more about it. Please Contact Us.